A special thanks to Amy Lin in the Art Exhibitions department there! Painting on site, away from the tranquility and comfort of one own’s atelier, is undoubtedly challenging even for the most experienced art professionals. We often wonder what draws artists like Lindsey Fyfe to participate in studio gallery projects? “I was attracted to the idea of people witnessing the process of abstraction,” explained Lindsey Fyfe in an interview for our very own WideWalls magazine. Working in front of a live audience and away from a familiar background or even a nearby toilet didn’t stop the painter from embarking on a two months long arts project hosted by EKB art space in Hartford. Lindsey Fyfe is a woman of many talents. 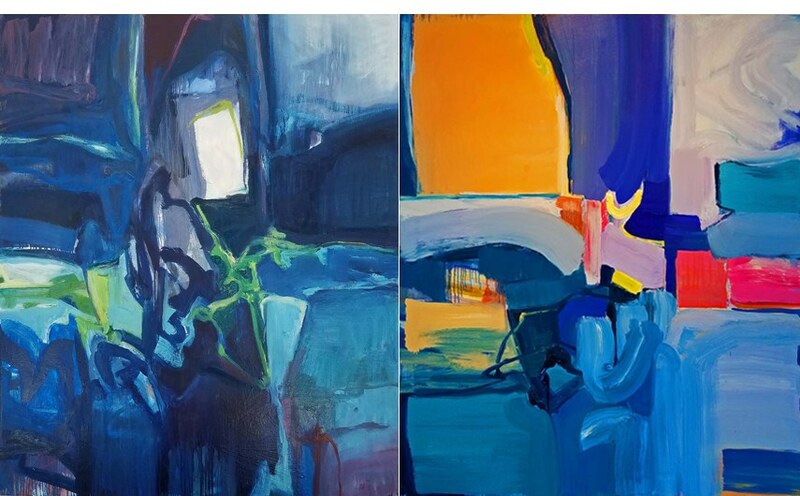 A painter and a bluegrass singer from Connecticut, produced an array of abstract paintings, drawings, and community street artworks while continuously maintaining a balance between these creative pursuits. Having graduated from Skidmore College in Saratoga Springs, New York, the artist moved to Scotland to pursue a Master of Arts degree from the University of Edinburgh. Her trip to Scotland is just one in the long line of travels that formed the artist both as a person and as an art professional. While many of her peers create meticulous sketches of their future artworks, Lindsey Fyfe approach is purely intuitive. She starts with a loose idea of what she’s about to paint and simply lets the paint lead the way. 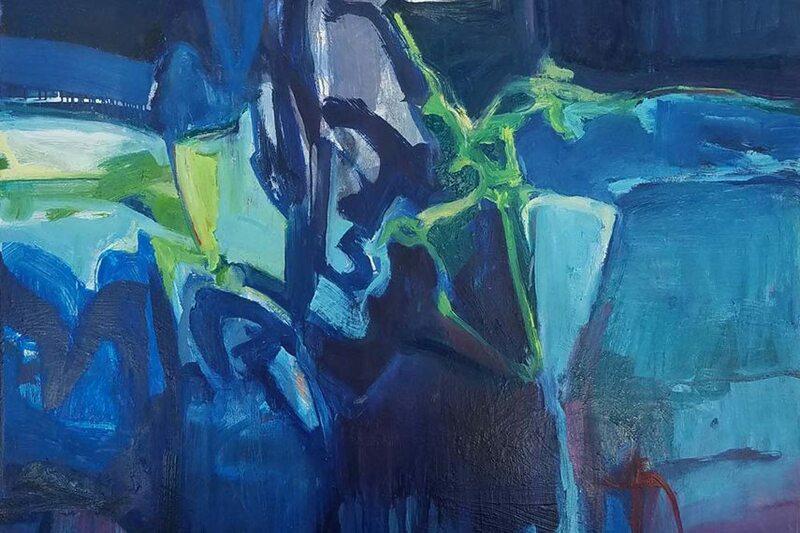 Her abstract pieces are created by spontaneous brush strokes that engage in a conversation with the canvas. These broad colorful strokes intersect to portray various natural elements that continue to be the artist’s most prolific inspiration. 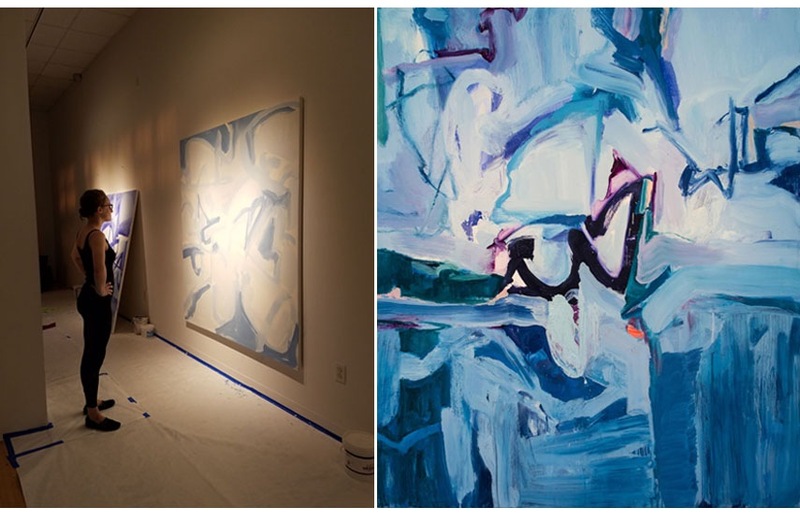 Artworks created during EBK’s Gallery Studio project, for instance, portray the phenomena of tradewinds encountered by the artist on her recent trip to Hawaii. 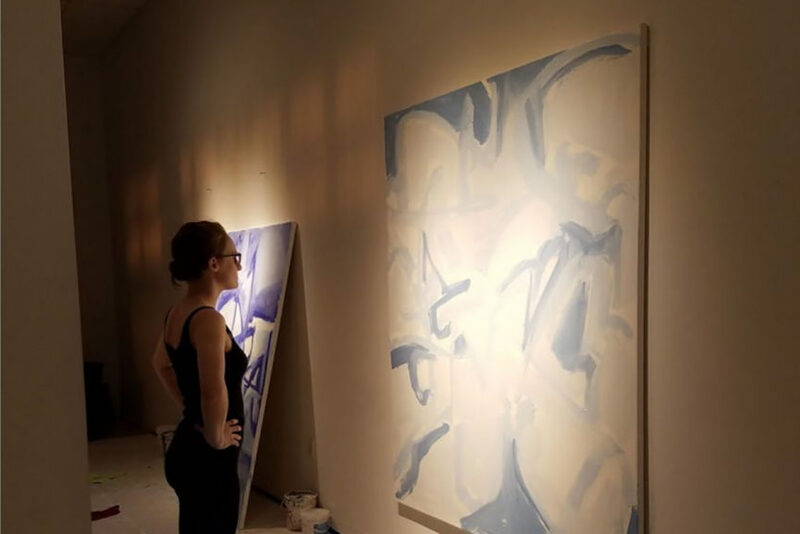 Every day throughout the months of July and August, Lindsey Fyfe was situated at EBK gallery in the capital of Connecticut where she worked on the creation of three large-scale tradewinds-inspired pieces. She started from a clear white canvas and applied layers and layers of paint until her recognizable abstract imagery was done and ready for sale. The visitors were encouraged to stop by, follow the creative process and share their opinion on the artworks every step of the way, which they often did, to the joy and at times, the frustration of the artist. In return, Lindsey Fyfe introduced them with abstract painting, art form less popular and less familiar to many art enthusiasts, especially novice. The viewers had a one-of-a-kind opportunity to explore and enjoy numerous layers of paint that will be changed and covered with other motifs and that will not be visible when the piece is complete. In an exclusive interview for WideWalls, the American artist talked about her singular EBK experience, the interaction with the audience and the challenges of working in gallery space. WideWalls: What attracted you to the idea of painting in a gallery? Were you a part of similar projects before or is this your first on-site painting session? LF: I enjoy sketching and doing watercolor studies in public, for instance, plan air landscape painting, but the residency at EBK Gallery was my first time making substantial abstract paintings in a public setting. 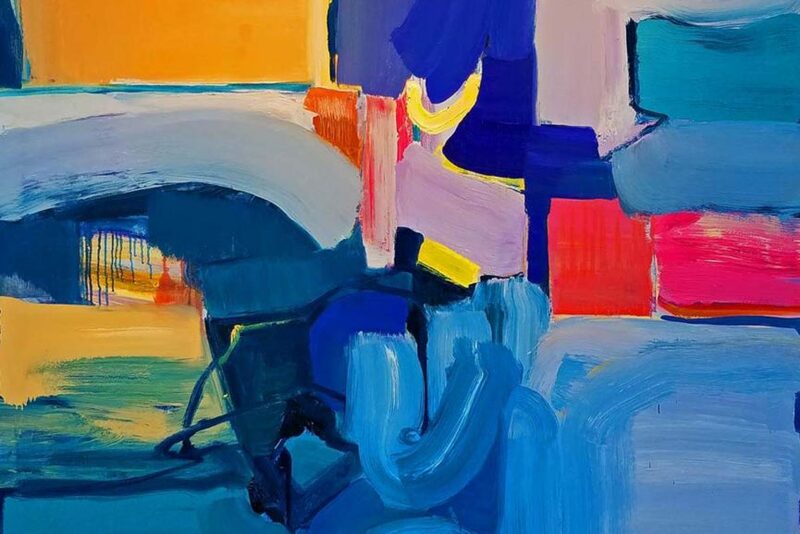 I was attracted to the idea of people witnessing the process of abstraction, which is a genre of painting that may be confusing or novel to some people, particularly those who are more familiar with looking at representational art work. I liked the idea of the public being able to see the journey of a big painting. Downtown Hartford is driven by insurance and finance, and the arrangement with Eric meant that the residents and employees of Downtown Hartford would be exposed to an artist at work, which is something completely out of the ordinary for our city’s fairly traditional downtown. Widewalls: How does working in a gallery differ from working in a studio? What are the main challenges of working on-site? LF: Painting on site had some basic challenges of no sink for cleaning brushes, no gallery bathroom (requiring making friends with all the local restaurant and bar staff–not really a bad thing!) and it also meant transferring all of my materials a few blocks over from my studio, and prepping the space to keep the floors clean, which is something I don’t worry about in my home studio. I was always aware of the public having the option to look inside, and although this was somewhat strange and fish-bowl-like, for the most part, once I got into a working session, I locked the door, turn the music up loud and imagined that I was in a regular studio. At the times when I wanted to engage with the public, I would prop the door open to encourage stop-ins, or make a post on my artist Facebook page that I’d have studio hours. It was overwhelmingly positive to be working in such a beautiful, public gallery space with wonderful lighting, stereo system, and AC- all welcome changes. I enjoyed when friends came by, and the space served as a home for new dialogue and conversation. Widewalls: How did you prepare for Onsite Studio Gallery Project? Did you make any sketches prior to the session or was the creative process more intuitive than meticulously prepared? LF: My style of painting is intuitive. I do not create preparatory sketches or paintings. I simply dive in to the experience of a painting. Eric prepared the canvases and we worked together to prep the space with proper lighting and mounting options. In making a painting, a build-up of real, truthful marks guides me to conclusion. Despite any and all research informing the artworks, intuition is the most important element of my artist practice. I am stirred by travel and new landscapes, and the key structural elements in my artworks reference the natural world: weather patterns, tectonic shifts, fields in bloom. But again, I didn’t prepare any particular sketches for these 3 artworks. I just dove in. During the summer, I journaled on the days that I painted. At first, the entries were lengthy and detailed, and quite thoughtful; as I got deeper into my painting head-space the comments became quick and basic, i.e., -today I made a ton of changes on the middle piece-, etc. Widewalls: During the project, the visitors were encouraged to stop by EBK gallery and follow the development of the artworks. How did they react to the pieces? Did their reactions have any influence on the process of completing the pieces? LF: One of the biggest differences between painting live in a gallery, and working in a private studio, was the consistent public feedback about the paintings, matched with a very strict deadline for completion. Deadlines are not out-of-the-ordinary for an artist, however, in this case, whatever I came up with during the 6 week period would most definitely be on view. I couldn’t have the option to replace or swap out a painting, or hide one, or not exhibit one. I was so fearful that I would not like the paintings that I finished with. Luckily, I brought them to conclusions that I was very happy with. The feedback that I received from viewers and visitors was overwhelmingly positive. Most people who passed by were art novices who were simply curious about the project, and impressed with the fact that it was happening. What was harder than usual was the positive feedback that I received only a few days or weeks into the paintings. Because my work is deeply layered, typically the public can’t see the underlayers, but rather just the completed painting. Traditionally, I don’t receive comments until the end. It was challenging to hear positive comments about a layer or a section of a painting that I knew I would certainly be painted over and lost. I always know when I have finished a painting, and it was occasionally frustrating to hear people urge me to “leave it!” when I knew I certainly was far from finished on a piece. It made me anxious that I would regret painting over something and want to go back. This was confounded by the fact that I kept photographs of all of the layers of the paintings; something that is not typical for my practice. On days when I was feeling more discouraged, it was hard to look back on the way the paintings used to look and wonder if I could get them back to a similar positive place. Widewalls: Tell us something about the pieces themselves. What was the inspiration behind each piece? Are the artworks meant to be seen as a part of the same series or should we explore each artwork as a separate entity? LF: I intentionally paint ‘big’ so that I feel overwhelmed by my own paintings, much as I do at the first step of a mountain I wish to ascend. These paintings are all 5×6 feet, oil on canvas. Approaching July, I wanted to tackle a theme that was related to travel and landscape, but that would also touch on the current state of affairs in our country. Travel in Hawaii in Winter 2016 made me, for the first time, keenly aware of the pattern of tradewinds that cross the tropics. I was intrigued and moved by this natural process of winds crossing these islands every single day, moving around the dust, stirring up new sensibilities to a day, and also their broad impact on historical navigation around the globe throughout centuries. I wanted to create a sensation of air moving through my canvases, to relate to these tradewinds that I was so affected by in travel. I like the concept of a breath of air, or moment of change, also sweeping into our current political affairs. I struggle with the present moment we are in here in the United States. I am uncomfortable with the amount of hateful and bigoted policies that we are faced with as an American public. I desire change, and I wish to subtly suggest a new moment, or a breath of fresh air, via these abstractions. Widewalls: What are your plans for the future? Are this type of sessions something you will continue to pursuit in the years to come? Or will you go back to the atelier and make Onsite Studio Gallery Project a singular experience? LF: The EBK experience was singular. My goal is to return to my active, private studio just down the road in Pratt Street, Downtown Hartford. I will continue making a combination of large scale works on canvas in tandem with the Happy Adventure series of tiny paintings. I was thrilled to exhibit with EBK and I hope that the exposure I received through this project will help me to gain new experiences with exhibitions, galleries and residencies around the country. As always, I hope to extend my travel catalogue to find new places of inspiration.